May also be interested in.. Air Stone & Pump, Clay Balls & Rockwool. Water Pump & Drippers Clay Balls & Rockwool. Water & Air Pump & Stone & Drippers Clay Balls & Rockwool. Water pump & all pieces required. 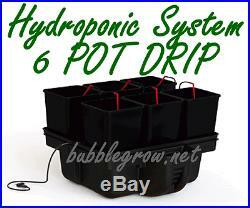 Professional hydroponic system for beginners and small spaces, simple, efficient and elegant. 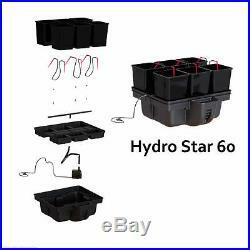 The HYDRO STAR 60 was developed in France by the engineers of platinum and hydroponics. Then the system is made in canada to guarantee quality hydroponics. To create this system they have totally noticed and analyzed existing products and system in the market. The system is equipped with easy access to the nutrient tank and a removable hatch to avoid light entering the nutrient tank. This system is made of ABS 100% premium food market plastic and is of a modular design which allows more or less to be added depending on the situation. Plants grow in 6 separate pots (18cm x 18cm x 23cm 6ltr) filled with clay balls, in a tray with 6 drip tubing to distribute the nutrient solution through out. Dimension: 60cm x 60cm x 40cm. Water pump: xtrapump 450ltr / h and irrigation bag included in the system. Tank from 25 to 30 Ltr. Allow 35 to 40 liters of clay pebbles. The item "PLATINIUM HYDRO STAR 60 6 POT DRIP HYDROPONIC SYSTEM + WATERPUMP KIT GROWING PLA" is in sale since Monday, November 17, 2014. This item is in the category "Home & Garden\Yard, Garden & Outdoor Living\Gardening Supplies\Hydroponics & Seed Starting\Other Hydroponics".